Aaron and Michelle Beckingham met while Aaron was on a visit to Gippsland from Shepparton. They got talking at the local and he showed up on Michelle’s doorstep a few days later. It was more than six months before he went back to Shepparton to collect his things! Three years later, the couple chose a classic black and white wedding with the Traralgon Vineyard as their backdrop, and a year after that baby Pearl arrived. Here is their take on the Danae Photography experience. 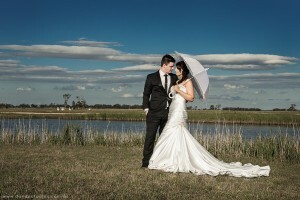 Michelle: “We got married at Traralgon Vineyard so we had the reception and ceremony there. We had five bridesmaids and five groomsmen, quite a large party. It was really white wedding style. “Dave did the wedding photos. I’m pretty particular but I had full confidence in how the photos would turn out. Dave just pays attention to every detail. They have a nice lake at the vineyard and Dave knew I wanted the geese in it so they are just subtly there in the background of the photographs. We went to other locations as well. We went to this random brick wall and I was thinking ‘how weird’, but when we got the photos they were awesome and the colour was really good. “I fell pregnant two months after we got married so when I was 36 weeks we had a maternity shoot. So I did some photos in the studio and we also went to some outdoor locations. Aaron: “Hannah did the photos of Pearl when she was born. Hannah’s like a baby whisperer, she’s gentle and patient. It made Pearl very relaxed. We were anxious about it beforehand but the photos have turned out amazing once again. “Pearl is changing every single day, so to have those pictures of her when she’s a newborn is amazing, just to have that memory forever and captured so perfectly.